This Christmas, Plympton teenager Jasmine Bayly is wishing for a brighter future for the thousands, who like her, are living with the uncertainty of a low-grade brain tumour. Jasmine, 15, of Rhodes Close, is helping bring her dream closer to reality by launching the Hope Tree appeal for the charity Brain Tumour Research at its Centre of Excellence at Plymouth University. Launched last month, the centre is the result of an historic new partnership between the charity and University, and will focus on low-grade tumours which, although slow growing and not immediately cancerous, can bring dangerous and debilitating effects to patients including neurological conditions, loss of balance, physical impairment, memory loss, epilepsy and personality changes. 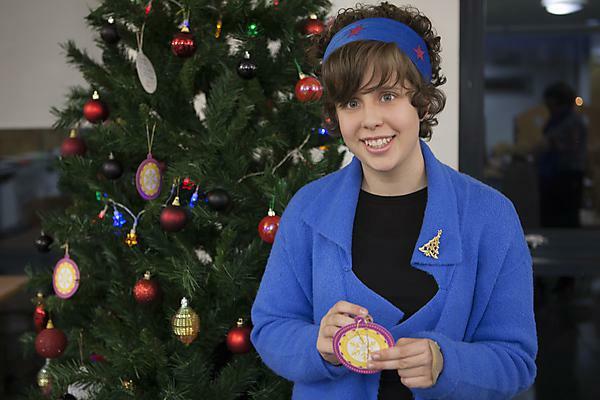 Heles School pupil Jasmine, who was diagnosed with a brain tumour five years after she learned she had the incurable genetic condition Neurofibromatosis (NF1), is hoping others will join her in fundraising to support the vital work of the centre by sending a donation this Christmas and writing a message of hope on a bauble. The decorations – many of which feature poignant messages dedicated to loved ones lost, those living with a brain tumour, and the research community committed to improving patient outcomes and ultimately finding a cure – are being hung on Hope Trees at Plymouth University and the other Brain Tumour Research Centres of Excellence at the University of Portsmouth and Queen Mary University of London. Jasmine is a keen fundraiser for Brain Tumour Research and related cancer charities, and so far she has raised around £5,000 by running a lot of small fundraising activities – such as a chocolate raffle. Professor Oliver Hanemann leads the work being carried out at the Plymouth University Brain Tumour Research Centre of Excellence. Already holding a reputation as a leading facility in Europe looking at low-grade brain tumours, the team will be able to further advance to translational research – taking research from the laboratory bench to drug testing and clinical trials. This will include exploring potential for the repurposing of existing drugs to ‘fast-track’ potential treatments, instead of waiting for new drugs to be developed, tested and trialled and passed for patient use – a process that can take a decade or longer. By understanding the mechanism that makes brain cells become cancerous in low-grade tumours, Professor Hanemann and his research team will explore ways in which to halt or reverse this process. The results from this research will inform investigations into high-grade tumours as high and low grade tumours share some common features. The team will work in collaboration with scientists based at Brain Tumour Research’s network of Centres of Excellence across the UK. To support the work of Brain Tumour Research and dedicate a message on the Hope Tree at Plymouth (and/or other Centres of your choosing) please visit https://www.justgiving.com/TheHopeTree. A day of research costs £2,740, while £1,000 helps publish peer-reviewed papers putting more pieces of the jigsaw in place. A donation of £300 pays for the vital equipment required for one day of research. Supporters are invited to donate from £10 upwards to take part in this inspirational display of hope. Brain Tumour Research currently helps fund – through corporate and public fundraising – an annual £1 million programme of research at their Centre of Excellence at the University of Portsmouth. Additional partnerships with Plymouth University, Queen Mary University of London and Imperial College in London, will pave the way for a £20 million investment in brain tumour research over the next five years, bringing the UK to the forefront of research in ‘the last battle ground against cancer’. The charity Brain Tumour Research is a leading voice calling for a sea-change in the level of funding for this devastating disease. By getting involved and holding your own event, you too can generate vital funds to help them in their mission to raise £7 million per year to fund seven Research Centres of Excellence across the UK.